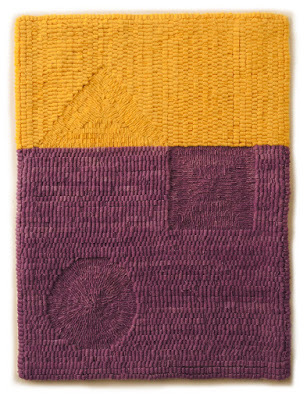 Studio and Garden: A New Textile: "Excavation"
Excavation, hand dyed wool on linen, 15 x 11 in. Occasionally it happens that a metaphor rises unbidden while I'm working on a piece, no matter the medium. Once it's stuck in my brain, it's hard to dislodge. With this piece, I had the feeling of hidden chambers below ground, as in Egyptian burial chambers within pyramids; I even have a triangle above ground! Please believe me when I say I had no notion of this until midway into the making of this piece. 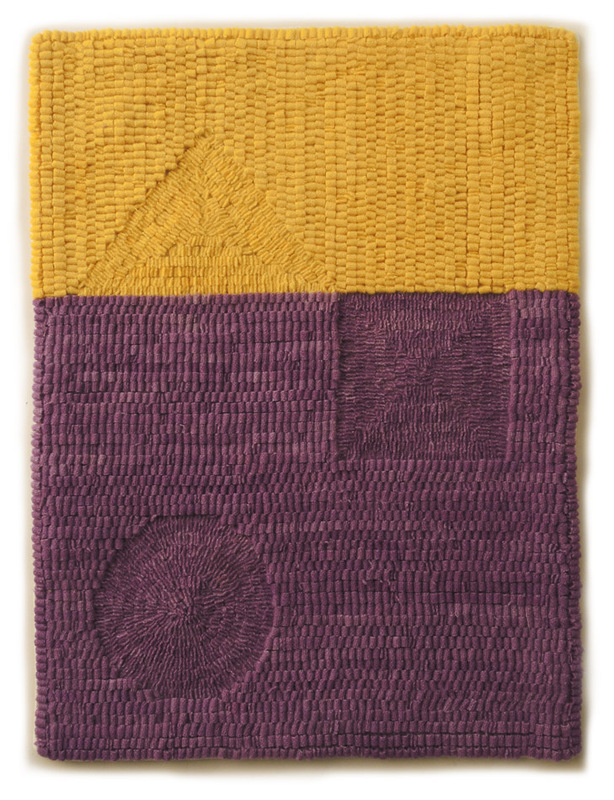 It was simply three basic shapes, cut away from the wool, with two colors. The colors, by the way, came by way of thinking of Matisse's cutouts; he often used a violet like this one. So....I called the textile Excavation, with a sense of humor, and with a bow to de Kooning's great painting of the same name; I hope I'm not being sacrilegious. 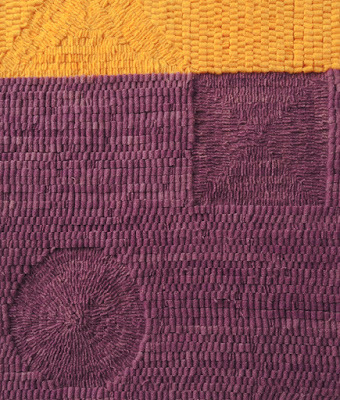 The differentiation of forms come from two things: the direction of the hooking of the loops of wool––I followed the forms, while the backgrounds use straight lines––and cutting away the tops of the loops, to create a sunken relief. 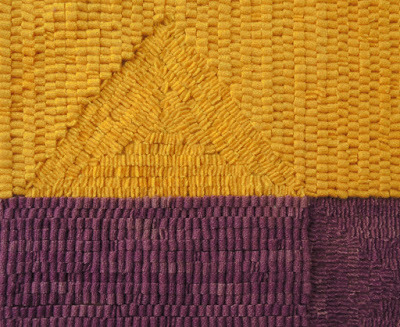 In this detail you can see the different directions of hooking in square and circle, and how they are set apart from the horizontal lines of the surrounding plane. I had briefly considered having the three shapes a different color from their backgrounds, but then realized I wanted a more subtle effect. 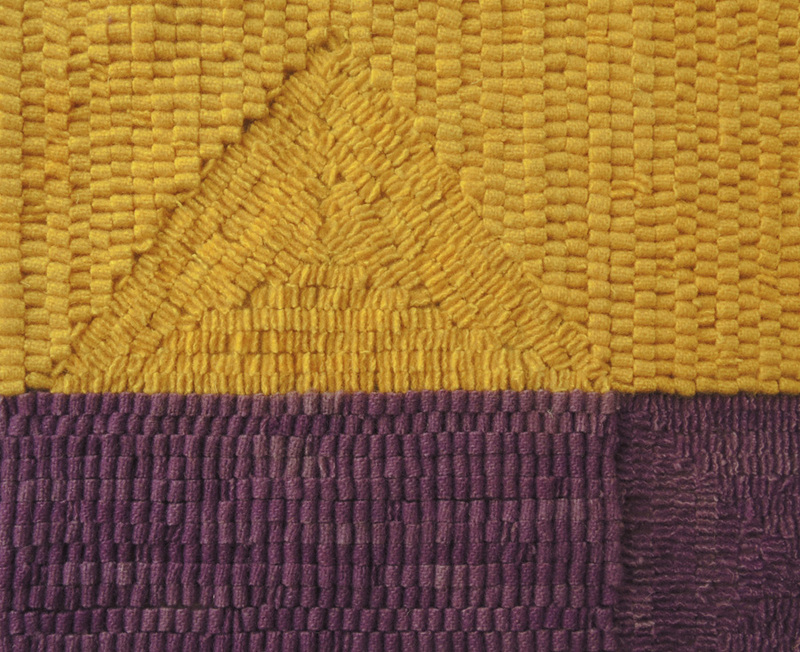 The two colors are not at all subtle, so to balance their intensity, the shapes are embedded within them. I really love this; everything about it – references, texture, colour, subtleties. The variation of tone in both colours are sublime. I love this technique, which introduces a significant contrast of texture and scale. (It's also one that looks terrific next to your website image (the painting Curves and Square) -- they rhyme. Thanks, Susan...and those images do speak to each other. Now this is a interesting. Makes me want to touch it. Thanks, Lisa. 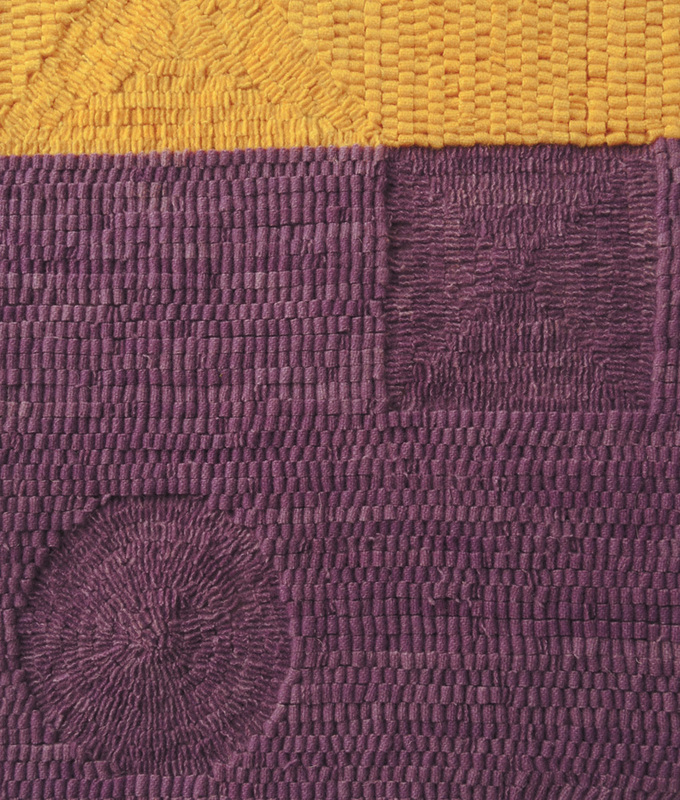 Tactility is a big part of these textiles, so I'm glad you want to touch it. O my god...its amazing....i think if you use this technique in rug it will do wonders. Love to touch it. A New Painting: "Blue-Green Rhythm"